Remember when we talked about Kant ages and ages ago? We looked at his idea of duty, which is basically this that human beings should act in accordance with duty, and their actions shouldn't be in any way selfishly motivated; an idea so far removed from any our our experiences that even Kant admits there is not a single example of any human action which meets this criterion. Because we can't possibly get this ethical principle from our experience, we have to derive it solely from reason, which Kant seems to think can operate independently of our experience. We need a moral code that comes purely from rational deduction. What might that look like? Kant thinks that if we want a moral code that's totally rational, it can't be bound up with messy ideas of what it means to be human, which inevitably brings in our experience (Why reason should be any less to do with our experience than emotions or motivation, Kant neglects to explain). So we need a moral code that would, in theory, apply to any rational being, human, angelic, alien, whatever. Now, everything in nature acts in accordance with laws, and what distinguishes rational beings is that they are aware of those laws and can choose to act in accordance with them (er, did you just derive a definition of rationality from experience?). So whereas stones always obey the law of gravity, we don't always obey the laws of morality. This means that moral laws are imperatives: they are all about what we ought to do, even if we don't always do it. Imperatives can be hypothetical, which means that they tell us we should do something so that we can achieve something else (You ought to go shopping so that you can buy the ingredients for baking biscuits) or categorical, which means that they tell us to do (or not do) something because it is good in itself (Eat biscuits). Because Kant thinks that what's really important is our motivation for our actions rather than the actions or their consequences, he doesn't really care about the hypothetical imperative: morality is all about the categorical imperative. The categorical imperative, by the way, is one of the ideas Kant is most famous for, so once I've finished explaining you can flaunt your new phrase to gain philosophical kudos, along with opera trinitatis ad extra indivisa sunt. Now, if you're trying to get something done (bake biscuits), you need skill (in baking) and prudence (good biscuit recipes and wisdom about which sort of biscuit is tastiest). It's all a bit vague and intangible (except the biscuits). But if morality is about laws, there's none of this fuzziness. Laws have to be universally applicable, so there is really only one categorical imperative: "act only in accordance with the maxim through which you can at the same time will that it become a universal law." That is, as you're about to eat your tasty biscuit, think to yourself: would it be ok if everybody else in the world ate biscuits? This is, in a way, where the biscuit analogy breaks down (crumbles?) a little. An easier example is this: say that you want to tell a lie, either to get yourself out of trouble or for a less selfish motivation, say, to hide some Jews from the Nazis. Can you honestly desire that lying becomes a universal moral imperative? It might make your life (and other people's lives) better right now, but imagine the chaos if everyone lied all the time. Lying can't be ok, because a universe where lying was a universal law would be a big old mess. It's not very intuitive, is it? What happens when, say, a categorical imperative to step in to prevent murder conflicts with a categorical imperative to tell the truth? What happens when the categorical imperative to protect human life conflicts with itself in the case of a mother whose life is endangered by a pregnancy? What happens when the categorical imperative to try to preserve our own life by eating (biscuits) conflicts with the categorical imperative to seek justice, but the only biscuits we can get our hands on are made by an evil multinational company who exploit their workforce? How do you even decide which categorical imperative you're acting on at any one point? If I eat a biscuit, do I imply that a) people should eat; b) people should eat biscuits; or c) people should eat chocolate digestives? Or is eating a biscuit an a-moral act, in which case, what about all the economical and political implications of my biscuit consumption? It's no wonder that Kant can't imagine even a single instance of a perfect moral act. 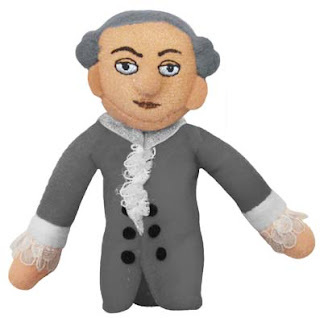 Photo credit: Kant finger puppet, for sale at the Unemployed Philosopher's Guild. Oh yes. Life's too short for everyone to read Aquinas.